Breaking down Arrow as a global organisation in 2016. 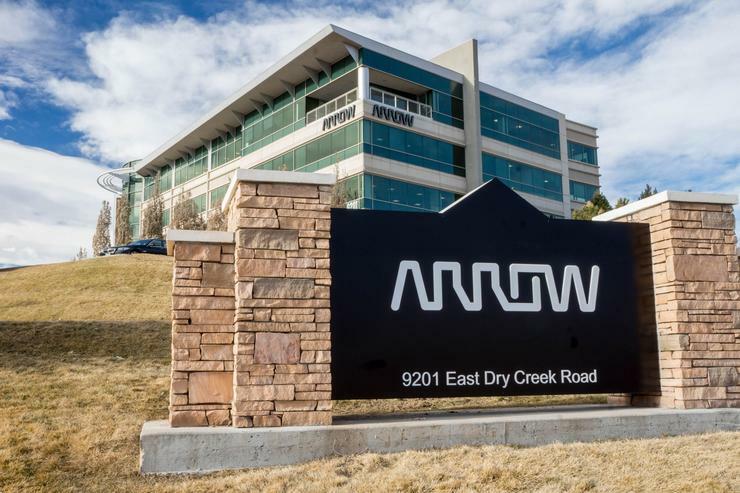 With 2015 sales of $US23.3 billion, Arrow guides innovation forward for more than 100,000 manufacturers of technology used in homes, business and daily life worldwide. Examples of awards and recognition: Recognised again as one of Fortune’s Most Admired Companies (2016), Ranked 131 in the Fortune 500 (2015), Named again to the InformationWeek 500 (2015). Arrow worldwide: Argentina, Australia, Austria, Belgium, Brazil, Canada, China, Czech Republic, Denmark, Egypt, Estonia, Finland, France, Germany, Hong Kong, Hungary, Iceland, India, Indonesia, Ireland, Israel, Italy, Japan, Latvia, Lithuania, Luxembourg, Malaysia, Mexico, Morocco, the Netherlands, New Zealand, Norway, Philippines, Poland, Portugal, Romania, the Russian Federation, Singapore, Slovakia, Slovenia, South Africa, Spain, Sweden, Switzerland, Taiwan, Thailand, Turkey, Ukraine, United Arab Emirates, United Kingdom, United States, Vietnam. Board of directors: Michael J. Long - Chairman, president and chief executive officer, Arrow Electronics, Inc; Barry W. Perry - Lead director, Arrow Electronics, Inc. Former chairman and chief executive officer, Engelhard Corporation; Philip K. Asherman - President and chief executive officer, Chicago Bridge & Iron Company; Gail E. Hamilton - Former executive vice president, Symantec Corporation; John N. Hanson - Non-executive chairman, Joy Global Inc; Richard S. Hill - Former chairman and chief executive officer, Novellus Systems Inc; M.F. (Fran) Keeth - Former president and chief executive officer, Shell Chemical LP; Andrew C. Kerin - Chief executive officer, The Brickman Group; Stephen C. Patrick - Former vice chairman, Colgate-Palmolive Company. Corporate social responsibility and sustainability statement: "With our help, our partners will transform their ideas into real and influential achievements. And just as technology touches all facets of our lives, we intend to foster new, cross-cutting collaborations between Arrow's CSR partners so their combined efforts will yield astonishing and unforeseen results. "Our innovations can make the world a better place for us all - now and five years out. To achieve these transformational results with our partners, Arrow seeks to develop innovative projects, in-kind donations of the company's expertise, board service for executives and equipment, employee engagement opportunities and other collaborative roles, in addition to making financial contributions. "Arrow’s global approach to sustainability focuses on the operation of our business. We strive for efficiency and maximising waste utilisation in our offices, facilities and distribution centres. "We distinguish ourselves by providing specialized services and expertise across the product life cycle. We seek to provide our suppliers and customers with solutions designed to help them produce products that are inherently more sustainable." Investorpedia tipped: In its article The Top 10 Technology Stocks for 2016, Investorpedia wrote: "Arrow Electronics Inc. (NYSE: ARW) is one of the world’s largest distributors of electric components and computer products. "During 2015, ARW struggled primarily due to unfavorable currency fluctuations. However, the company has been seasonal toward the end of the year (2015), especially in Europe, and is expected to carry that positive momentum into the New Year. "Arrow has packaged its core products and value-added services into a comprehensive solution that lowers the cost base over a product's lifetime, yet adds higher client engagement. "With a diversified product line and successful current strategy, Arrow is well positioned to grow to a target price of $65."